Senior Austin Kessem with his mother and brothers, after winning the State Championship. Flying down the ice with his hockey stick in hand and puck under control, senior Austin Kessem dekes out an opponent, waits for an open shot, and fires at the goal. The blaring noise of the goal horn signifies his laser shot as he scores a goal. Kessem is well known in the senior class as a friendly, hilarious guy who is tons of fun to hang out with. He is also an incredible hockey player who is currently playing for the Highland Park Falcons. 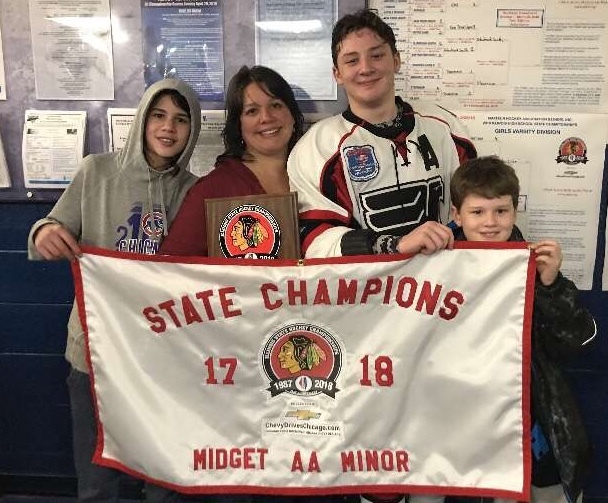 He received his first hockey stick when he was just four years old, and from there, the long road of his hockey lifestyle began. Through the years, Kessem has played for many different teams in many different locations. The team he currently plays for won the State title last year and even went to Nationals in New Jersey. Last year’s State matchup in Bensonville that sent the team to Nationals was a very exciting and hard-fought game. Many of Kessem’s friends were in attendance at the game, including two of his best friends, seniors Sean Eslick and Shayn Szlak. Neither of them could believe what they saw, and they couldn’t have been more proud of Kessem. Szlak notes the feeling of being proud of his friend during his state game. After all the excitement and joy there was to be brought after winning the state title, it was time to get back to work. Kessem and the Falcons were off to New Jersey to compete in the National tournament. Having to come home not being able to win the National tournament certainly hurt Kessem and his team; however, it isn’t stopping their desire to do it all over again this year.